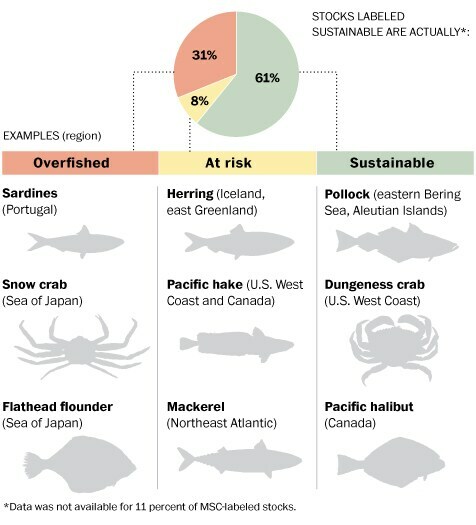 Is Any Fish Truly Sustainably Fished? 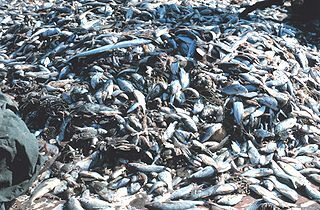 A pile of shrimp bycatch. There are probably a few, but good luck figuring out which. When my daughter and I went vegetarian we grappled with the question of whether we were just going meat-less, or meat-less AND fish-less. My daughter, bless her heart, had no question that we should leave fish alone. And I was fine with going along with her, partly for humane reasons, but also very much because all the evidence is that there are very few species of fish (whether wild-caught, or farmed) that are sustainably managed. And even fewer that don’t have some negative environmental impact (such as bycatch, disease transmission, antibiotic resistance, etc., etc.). So meat-less and fish-less we became. Starting Sunday, gray sole and skate, common catches in the region, will no longer appear in the grocery chain’s artfully arranged fish cases. Atlantic cod, a New England staple, will be sold only if it is not caught by trawlers, which drag nets across the ocean floor, a much-used method here. Whole Foods says that, in fact, it is doing its part to address the very real problem of overfishing and help badly depleted fish stocks recover. It is using ratings set by the Blue Ocean Institute, a conservation group, and the Monterey Bay Aquarium in California. They are based on factors including how abundant a species is, how quickly it reproduces and whether the catch method damages its habitat. Many retailers tout the environmental credentials of their seafood, but a growing number of scientists have begun to question whether these certification systems deliver on their promises. The labels give customers a false impression that purchasing certain products helps the ocean more than it really does, some researchers say. Backers respond that they are helping transform many of the globe’s wild-caught fisheries, giving them a financial incentive to include environmental safeguards, while giving consumers a sense of what they can eat with a clear conscience. …The most stringent and commonly used certification is that of the Marine Stewardship Council, which has certified 148 wild-caught fisheries, or between 6 and 7 percent of the global supply. It uses independent reviewers to determine whether a fishery earns an MSC-certified label and can be classified as sustainable — meaning that the fish is relatively abundant, the fishery is well managed, and catching it does not harm other species or ocean habitats. It is a measure of the attention focused on the world’s fish stocks that the council’s work has come under scrutiny. There’s no question that if you are going to eat fish, you should buy only fish that is certified as sustainable by…someone (and hope that it really is). But, to me, the only unambiguous way to protect and preserve fish stocks is….not to eat them. I rarely eat fish these days as I feel most methods of fishing are destructive. I’d like to believe the certification on sustainability but can’t help thinking there is a certain arbitrariness to the monitoring and enforcement of fishing practices.